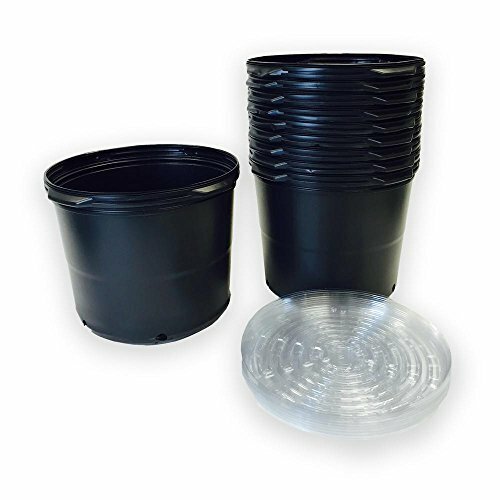 Round plastic nursery pots and water catching saucers are inexpensive and durable perfect for many types of soil or hydroponic growing media. The raised rim design allows easy handling and easy stack ability when not in use, can be used indefinitely. Please note that our pots are measured in Trade Gallons. A Trade Gallon is a term used to denote the sizes of standard plant containers in horticultural industries. A Trade Gallon is equal to approximately 0.71 U.S. liquid gallons. Can be used with various types of soil or hydroponic growing media. Portability and construction make pots perfect for greenhouse, indoor growing and outdoor applications. Saucers offer great protection for carpets and floors by catching leaking water. 100% recyclable plastic is waterproof and strong.